It's official, vegetables season is in full swing. Not only did I get my garden planted but today, I got my first CSA basket! I opted for an early share so it's a little smaller than the usual basket that I will be getting once the CSA is ready but it's awesome to start getting some über-fresh vegetables. Here's everything that was in my bin ... not bad for $20! Did I mention that these are all local and organic? I know, amazing! Try finding that at your local supermarket for that price. And don't say, "What are those vegetables ... I would never use them!" As we know, simply Google the vegetable and you'll not only find out what it is, but also amazing recipes to use them. My CSA actually likes sending different recipes for people who may not know how to use their vegetables. Last year I had do idea what a hakurei turnip was and now I love them. I was so excited for those to show up in the basket. It was like Christmas! 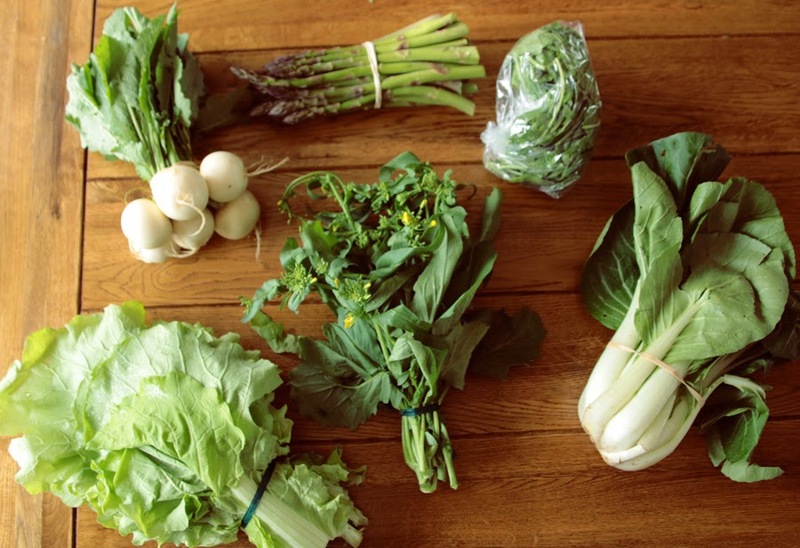 Many CSAs are still taking members now, but don't wait much longer or they will all be filled. I know the price may be a little daunting at first, but once you divide it out by the weeks that you're getting you'll be surprised at the actual cost of what you are getting. To find more about the benefits of a joining a CSA, check out my CSA page or find CSA near you at localharvest.org. You’ll be surprised at all the options you have right in your own backyard!